Once you have been to La Casita Bonita Del Mar you will want to return! This is Home not a condo. It has Privacy Without Neighbors Watching you!! It is located in Las Conchas, a premier residential community with controlled access (24 hour-Guards) and the most beautiful beaches – peaceful, quiet, sandy and expansive. 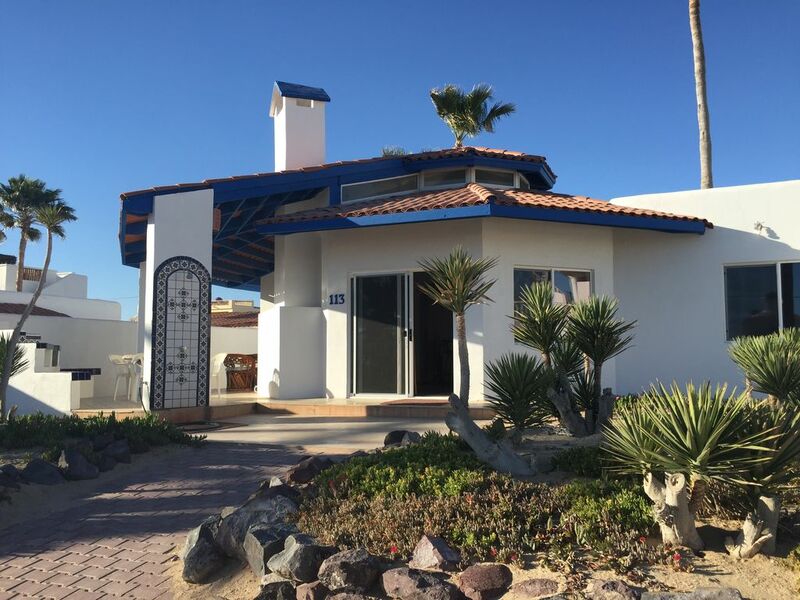 Just minutes (5) to downtown Puerto Penasco, (Rocky Point). This is a cozy Two-Bedroom Beach Bungalow (single level-Home), a Fabulous View of the Ocean. The Casita is Second Tier, yet just 50 yards from The Beach with The Beach Walkway Right in Front of The Home. Relax on the front patio with the sounds of the ocean or down on the beach enjoying the warm Mexican sun. Grill some fresh catch on the BBQ Grill. 2 TV-Monitors only/DVD-VCR players in both bedrooms, DVD-VCR Movies, Air-conditioning, Ceiling Fans in all rooms, A spacious front porch with ample seating, BBQ Grill, Outside shower. Sheets are provided for King Beds. Owner requests No Smoking Inside. Pets are always Welcome, No Pet deposits, but the responsibility for clean up inside and out is yours. The kitchen is fully equipped with dishes, a coffee maker, blender, microwave and toaster. Go to the Beach and enjoy, Visit Puerto Penasco (Rocky Point)lots of shopping and markets, Rent a Jet Ski, Rent an ATV, Go Parasailing, Take a sunset cruise, Go sailing, Take a snorkeling trip, Go deep sea fishing, Go scuba diving, Visit the CEDA Aquarium, Visit the Pinacate Volcano, Try some fresh oysters from one of the many oyster farms, Visit the fresh fish/shrimp market, Dine in one of the many fine Restaurants, Spend a day clamming and enjoy your fresh catch that evening, Go Horseback riding on the beach, See the wonders of the tidepools, Rent a kayak or boogie board, Plan a romantic get away to share the most breathtaking sunsets in the world. Outside shower to rinse the salt water and sand off. 2 TV-Monitors Only/DVD-VCR players in both bedrooms, DVD-VCR Movies, Games, Air-conditioning, Ceiling Fans in all rooms, A spacious front porch with ample seating, BBQ Grill, Outside shower. The kitchen is fully equipped with dishes, a coffee maker, blender, microwave and toaster. Sheets and bath towels are provided for King Beds. Owner requests No Smoking Inside. Pets are always Welcome, No Pet deposits, but the responsibility for clean up inside and out is yours. Location: Puerto Penasco (Rocky Point), Sonora, Northern Mexico, Mexico (65 miles S. of the AZ Border 3 1/2 hr drive from PHX or TUC) On the Sea of Cortez!